Advantages: Appearance. Bright. Ease of installation. Quality. Weight saving. Price. Disadvantages: I need more stickers in my package!!! These things are way brighter than the stock Lights! 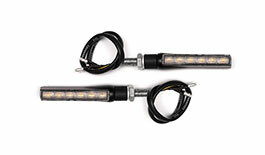 I wanted to get rid of the huge ones that came on the bike and at the same time wanted something that was brighter to catch the attention of cars and idiots behind me and these do the trick. I always ride with my go pro on just in case but felt that If and when I do get rear ended I can show in court that I had bright lights that were a lot better than the huge dim pumpkins that I replaced these with cant ever be too carefull! Advantages: Super bright and slim, So easy to install a caveman could do it!